I first met Ezra Firestone at the Ecommerce Fuel conference in Austin, TX and I’m really glad that I did. Ezra is an expert when it comes to content marketing and PPC advertising and I was lucky to catch his presentation at the conference. 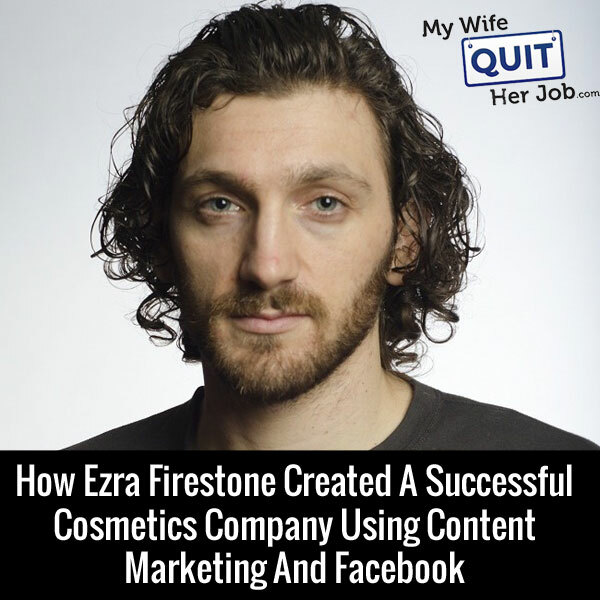 Ezra runs the popular pro age cosmetics company Boom! By Cindy Josephs. He also runs the popular blog Smart Marketer. Be sure to go and check out his websites! How to structure your content to generate leads for your ecommerce store. How to generate Amazon reviews for your products. Steve: Welcome to the Wife Quit Her Job Podcast, today I’m really excited to have Ezra Firestone on the show. Now Ezra is someone who I met at the Ecommerce Fuel Conference in Austin Texas, and the guy actually does a ton of stuff. First of he runs a pro-age cosmetic line called Boom by Cindy Josephs and he also teaches others how to start an effectively run ecommerce store at smartmarketer.com. Now based on a lecture that Ezra gave in Austin at Ecommerce Fuel Conference, I actually followed his advice to make my facebook campaigns profitable. Now here is what I like about Ezra, the motto for his site is serve the world unselfishly and profit, now how cool is that. And Ezra holds true to that model with lots of free content and tutorials. Anyway we are going to explore the methods that he has used to make Boom by Cindy Joseph a powerhouse company and with that, welcome to the show man. How is it going Ezra? Ezra: Thanks man, I’m happy, to be on MyWifeQuitHerJob.com, I get excited when I hear that URL just like as [Inaudible] [00:02:30] so I just want to keep saying it over and over, I’ve been repeating it, I’ve said it like four times most to my wife and she’s like okay, that’s enough. Steve: Appreciate that man; hopefully we can turn your wife into a reader and a follower. Ezra: Yes, she’s into podcast, so I’m sure. Steve: All right man, so what is the background story behind Boom and how do you hook up with Cindy Josephs? Ezra: Okay, so you know Boom– it’s kind of a long story, but I will give you the shorter version which is that well I’ll give you that version and you can tell me if you’d like more. Ezra: So I grew in an alternative lifestyle experiment, sort of a hippie commune of sorts in the Bay of California, and it’s a really-really fascinating place. And my parents and this group where I came from called [inaudible] [0:03:18] they teach courses and things like communication and jealousy and money and possessions and man-woman relationship, and kind of things about what it takes to have a successful relationship of any kind not just like across the gender line, but just relating in general, how do you win that relationship? It’s really something that’s helpful you know, having successful relationships is kind of what you need in life to be successful in any venture. Ezra: You need to have successful business relationships, successful personal relationships, and so they teach these course and Cindy was– would come and take these courses, and when I was 18 you know, I decided that I wanted to move out to New York and I had made friends with Cindy who would come to our house and take these courses. And so I called her up and I said hey, I would like to move to New York, can I come stay with you? And she said yes. So I moved out of there and I was playing poker for a living, I played in all these underground clubs and I was doing quite well. Ezra: Yeah, man the whole of the poker world in New York City is a whole other thing, but that was really wild times and really fun, but I become very close friends with Cindy. We were sort of like best friends and she was 55 at the time and I was 19. And I was a little bit of from the time I was 18 to 20, 18 to 20, 18 to sort of 21 and we would have all these conversations about sort of ageism and you know, the difference in how society treated the both of us you know, me as a young man and her as an older woman, and it turns that in western society and in America and in most western civilizations men are valued for production. So like as we produce more, as we make more money and as we get older, we get more social power and more value in the eyes of society. And this is not a view point that I subscribe to obviously, but it’s the way that society views men and women. And women on the other hand are valued for youth and beauty, and so as they get older society you know, tells them that this power that they have goes away and you’ll notice that all the messaging towards older women is that, hey this process, this ageing process is a thing that is happening to you is bad, it’s wrong, it’s anti-aging, anti-wrinkle. You know you want to stop this thing and you know we have 80 million baby boomers, half of them and which is the largest part of our demographic, the whole entire United States the largest demographic are the baby boomers, half of them are women, and they are all collectively having the experience of their hair graying, their skin wrinkling and their bodies aging on the outside faster than they are on the inside, or just ageing in general and society treating them differently as a result of it. And so you know, she was experiencing this first hand and Cindy used to be a very famous and successful makeup artist. So she was a like a make put artist to Trya Banks and Cameron Diaz and all those people, and I was learning at the time about ecommerce and online marketing and I said hey, you know, we ought to leverage this celebrity that you have. She also became a fashion model, now she is a very famous fashion model because brands were realizing that, hey baby boomers have money, and we ought to use them in ads to sell them things, sort of a noble concept. But so you know, her first response was, hey like you know, do you think the world really needs another [inaudible] [0:06:38] lipstick? And the answer is no, the world doesn’t need another [inaudible] [0:06:42] lipstick, but we ultimately decided was that we would create a cosmetics line that was Pro-Age, that was you know, all the cosmetics would be sheer and natural and organic, and it wouldn’t be about covering your skin up, it would be about you know, showing off and celebrating who you are now, and so our cosmetic line is a Pro-Age cosmetic line. We were the first people, there are a bit of Pro-Age campaigns, a couple of people have done a Pro-Age campaign now, but that messaging to that group of people worked really-really well and the way this business is build is that it’s not like we didn’t have– there was no nobody searching for our products. We didn’t have any query based traffic which is how all my other ecommerce businesses were built up to that point; it was all the query based traffic. So this business was built 100% with content marketing, with engaging with a group of people in a conversation about what was happening on their lives, and then making them an offer from there. And it went really-really well because you know, there is nobody– it’s a good sort of example of the right message to the right market at the right time. Steve: Yeah, those are some deep conversations to have at such a young age Ezra. Ezra: Hey you know thanks I came from the cool place. Ezra: Well there just wants anyone searching. Everyone was searching for anti-aging everything. Ezra: And we are not anti-aging and you know, we did some– we do some right, where we convert people and say, hey, you are looking for anti-wrinkle cream, but check this out and sort of like we try to convert them, but it’s much easier to catch someone through a piece of content. So like, let’s look at content marketing in general, right. Like this is the– it’s been around forever, it’s not like we invented this thing, so soap operas are content marketing, like the Deb and Johnson and Johnson, all these companies created soap operas so that they would have their target audience is engaged and they can place products in that piece of content. American Idols is one big piece of content designed to sell you a record you know. So this idea of engaging someone in a story and getting their attention and getting them enrolled in an idea and then moving them to a sales message has been around forever and is an, it’s the soul concept that we use, sort of soul bit, the main model or funnel that we use in all of our business. And if you look at how we use it from a contextual traffic stand point, what we do is we run facebook ads to what we call a pre-sell article. So an article on– that engages someone, that enrolls them, so for example, I’ll give you a perfect example right now. I just told you I’m running Pinterest ads, right? We started a couple days ago; we spent $8 to generate $200 of revenues. So Pinterest ads are doing quite well, but the way we are doing it we are running people into an article that says you know, XYZ make up tips for older women, and then it takes them thorough this whole article about make up tips and what to do if you are you know, how to wear makeup as an older woman and this kind of stuff. And then it leads them over to Boom and says hey you know we have this makeup line and takes them over to our sales page, our product offering, and that funnel where we are taking someone form a traffic source where they weren’t looking for, they weren’t looking for makeup and we enroll them in a story because we know something about them, either age and their gender, and then we make them our product offers. That’s sort of a good example of direct response content marketing. However, Boom was build not on direct response content marketing, Boom was build on just traditional content marketing where we would you know put up blog posts about– that had nothing to do with our skin care, just about you know, how we felt about XYZ topic, or what we thought about menopause or our view points on ageing. And then it would be on our blog which was on our website, so people would share that and they would end up back on our stores. So it was a little bit different how we did Boom, it wasn’t as direct response. Steve: Yeah, I was going to ask you about that, so in the very beginning you just started out with a blog for the most part? Ezra: Yeah we just– basically what we did, we created this blog and we just promoted content for about six months really heavily on all the social channels, we also had a press agent who would give us spots on magazines and you know radios and TV and stuff like that. And really through the promotion of this content we build the community of people who are interested in following this content. And then what we would do is we have sales and we make offers to that group, and so that’s still my business model in general. If you look at Smartmarketer.com, if you look at any of my other businesses my agenda is to build the community who is engaged with me around a specific set of topics and conversations, and then make that community offers that I believe are relevant to them. Steve: So was the store up first and then the blog, or did you kind of start the blog first? Ezra: The store was up from the start. Ezra: I mean we were not going– I mean we were getting some sales, but we weren’t really, we didn’t really, we didn’t have anyone to sell to and we didn’t, we couldn’t buy query based traffic. So we kind of just had our store there and we had the do concept for quite a while before we build that community, and now we have such a large community and our content is so viral, every time we post it because everyone shares it that it sort of significant, we are easier now. Steve: I see and how did the people find your blog? Just through popular topics that women of that age experience? Ezra: We bought ads on Facebook to promote our content. Ezra: We bought on you know, different– we did traditional contextual traffic sources to promote our content, so our content was not by any means, we didn’t just throw it out there and say you know hey good luck to us you know, we deliberately purchased traffic to our content from that demographic, most of them Facebook. Steve: Okay and this– when did it start because Facebook ads didn’t come around until maybe like five years ago? Yeah. Ezra: We didn’t, our business really took off in 2010 Boom, although Facebook has real ads, Facebook ads pretty heavily in 2009 but there wasn’t Boom yeah, but I mean without Facebook I think we would have been lost. Steve: Okay, so let’s go into a little more depth since you mentioned you have such good Facebook success, how do you structure an ad, and how do you kind of structure this campaign and how does the whole funnel work? Ezra: I mean for Boom it’s pretty simple, right. What we do is something called the third contact direct response advertising, where we take a piece of content, and we market that to a specific audience. And all we are doing is sending people from Facebook to our blog, or even most of the time from Facebook to our video on their news feed but we are not even asking them to leave Facebook, they just have to consume a piece of content right in our news feed, but then after they’ve seen a couple of pieces of our content, we then run a direct response ad to that same group. That’s why we call it third contact direct response because we don’t run the direct response ad until they’ve had at least three contacts with our content. And the direct response ad might just be a simple email often which then leads to a funnel that has a webinar in it, or it might be a simple email often that just then leaves to our store page, or might be a sale. So that’s really the strategy that we use on Boom is really we promote our content and then we promote direct response offers. That’s pretty straight forward. Steve: Okay and then how do you measure like the effects of a particular ad on conversions and that sort of thing? So you have someone you send to a piece of content, and then you can track that, but then you have them going to your email list like a special separate email list? Ezra: Yeah, when you get to our blog we’ve got a bunch of– we’ve got– obviously I have retargeting pixels on the pages they’re landing on. Ezra: On advertising your content, and we spend a couple of grand a month, we don’t spend a whole lot believe it or not on Boom at this point with our content marketing anymore, just because we’ve built up such a great community and we get so much social shares and all that kind of stuff. But I think that you’ve got to be willing with content marketing to invest in five/six grand over the course of a couple of months to build that community, and to get the name out about your content before you start trying to optimize. And then from there what you do is you have direct response optimization campaigns, where you’re not really relying on your content to make money for you for monetization. You’re relying on it to engage with people and get them back to your blog and get you email opt ins and stuff like that, and then you have direct response campaigns that you’re running to your current community, the people who are on your retargeting list, the people who are on your on email list and you’re using that to optimize. So the content is really about building the community, you’re not really measuring– what you’re measuring is how many leads you get, how big are you are your retargeting list? And how many leads are on your email list? Steve: Okay and then so just for some of the listeners who might not have I guess products that might be interesting, like your product line caters to a very specific demographic. So how would you proceed with a business let’s say you’re were selling mops or something like that, how would you…? Ezra: Yeah like we’re doing this kind of thing with a bunch of Amazon business owners who have like garlic peelers and like yeah, all kinds of random stuff, so it’s like, How not to Cry when you’re Peeling Garlic, what’s on– the Dirtiest Part of Your Floor, or like Do You Know What the Dirtiest Part of Your House is, or whatever it is the kitchen sink is what people say right, that has the most germs or whatever, like you can do content about anything. That’s gets used a lot– fear as a motivator to get your attention. So there is fear, there is curiosity, there is humor. We use humor a lot. And there is a bunch of other psychological triggers that you can use: shock and all. I’ve got a list of them that we look at before we write a pre-sell article. I think that essentially what you are doing is engaging someone in a story. It’s not really about your product in the end; it’s about something related to your product that’s interesting. And in any product– like why would someone be buying a mop? Why would someone be buying an air filter, because there are afraid that there is like dirty stuff and other stuff in the air that they don’t want to breathe in, and so then you create an article about that. So it’s essentially related to the solution that your product provides. Steve: So let’s talk a little bit about this landing page. So it’s just– you mentioned it could be just like a blog post. Ezra: It should be a blog post actually. It should really be– articles work better than videos, best is to have a video on your long form article page, and you want to write it like a traditional article like with bullets points, five things, five reasons, five steps to this, or how to do this– any kind of article that’s engaging. And you can look at buzz feed, and you can look at a bunch of these other sort of big content websites to get ideas for– there is actually one– there is a place Zerg Z-E-R-G-N-E-T.com. It’s called Zergnet.com. Ezra: And it’s a website that has viral content on it, for like all kinds of industries, a lot in the sort of Hollywood industry or whatever, the sort of celebrity world– Zergnet.com. And they’ve got like you can go on there and you can see all these different articles that are really popular, and I’m looking at it right now. I’ll just read them to you: six things you didn’t know about liquor’s most popular brands, crazy things you never knew about the Transformers movies, 10 games that are just relaxing to play, five weird games that actually exist. So you can kind of take some ideas from these blogs of what’s going to be a compelling article and then you can write that about your industry. Steve: Okay. And then the goal of that landing page is it to get some sort of email sign ups so you can get that [crosstalk]? Ezra: The goal of that landing page is to get people to click through to your product offer. It’s 100% to move them– to basically engage them in a story and then allude to the solution that solves the problem that you are telling them about, and the solution is your product. Ezra: And of course we retargeting pixels on the blog and we’ve got email opt-ins. We get quite a lot of email opt-ins and that kind of stuff, but it’s really designed to move people over to your product. Steve: Okay. Yeah, no, when I was designing my funnel based on your advice that you gave at that conference, I had to experiment a whole bunch of time to get people to click over because often times they just read the blog post and then they leave, right? Ezra: Totally, totally. You’ve got to– you put a bunch of blue underlined links and you can’t have a blog about– let’s say your product is a mop and you’re telling, “Here’s like– you want to know some good cleaning tips, here is how you clean your kids clothes” yardi, yardi, yarda. And you don’t even talk about your mop, because that’s not going to work. Steve: Yeah, yeah. So what I ended up doing was I think I had pop ups to collect emails at the bottom, slide ins and then I also had links on each of the photos that I put in there, and then gradually it finally worked out where I could make a profit. But it was a long process actually. Ezra: It’s going to take some optimization. We’ll find that like one out of five articles that were using for this pre sales strategy would be effective. So it’s not like this– I’m not saying this is easy. You got to be willing to work and test and tweak and put in energy and effort, but what I am saying is that if you can dial this funnel in, then I don’t think there’s a better one. There’s no better funnel out there. It’s the most profitable funnel that you can create because it’s– when you do it right, you’re engaging someone in a story, and then eluding them over towards a solution which is just so effective. Steve: So in terms of budget, I know there are some listeners who drop ship, there’s some people who sell other people’s products, what should be your profit margins in order to make Facebook kind of a viable prospect? Steve: In terms of how much it would– in your experience with like your healthcare products– with your beauty products, how much do you spend to get a conversion? Ezra: Our store is a little bit different right, because we have such a big community now. But if you’re just talking about cold Facebook traffic, we’re spending between $10 to $20 to generate a sale. Ezra: I think for people on– I think in my view point is that drop shipping is quite difficult these days with buying cold traffic, and so if I was a drop ship retailer, I would probably switch my motto to purchasing emails, because there’s no market on Facebook right now where you can buy email addresses for five bucks or under. I mean with a little bit of optimization I’m talking about Facebook ads directly to like a lead page that says, “Hey learn XYZ thing, or get XYZ eBook, or find out XYZ trick about cleaning your house, where you’re generating email. Then I would– if I was drop shipping I would have a 45 day sequence of some kind like that, sends people to a couple of pieces of presale content, this is through email not writing– generating your email with lead, and now you’re sending them to a couple pieces of presale content over the course of a week, but then lead up to your products, then you’re inviting them to a webinar where you’re spending and hour with them telling them how great your products are. Like I would have a much longer form sales funnel for if my margins were lower than they are now, and I used to have significantly lower margins, because I was a drop ship retailer. So I needed longer form funnels to convert a lead into a buyer, and so it’s really about what can you a lead for, and what kind of profit are you making per sale? And I think it’s easier for me because I have a consumable, right? Ezra: Like people come back they purchase from me a couple of times, and I very deliberately– and then markets where that’s the case, because I understand that these days if you’re breaking even on advertising you’re doing quite well, if you’re acquiring a customer at break even that’s like a really good thing. And you want to either have additional products on your line that you can sell people, or a consumable where people will back, or some way of getting repeat business. I think that it’s quite difficult to have a successful business if you are onetime sale only, unless that one time sale only unless that one time sale is a pretty high dollar value. Steve: Okay, and just a couple of details regarding Facebook, do you advocate buying likes and then marketing to that crowd or do you…? Ezra: I advocate purchasing likes from retargeting, so here’s– I don’t advocate purchasing likes straight up, I think that’s a terrible idea. Ezra: And there’s much better ways to spend your Facebook dollar, I do advocate purchasing likes from your retargeting list. So basically have a retargeting pixel on your website, right? And if you’ve ever visited my website or any of my websites, and you’ve been haunted by this ad because it follows you around everywhere where it says, “Hey thank you so much for visiting our website, please click like to stay in touch,” that’s all the whole ad that’s it, and then it’s a like ad to get them to like our page. The reason we do that is because our Facebook fans are really profitable audience for us, but its only fans of people who actually visit our websites, it’s not just random fans off of Facebook, it’s actually people who have engaged to the degree of making it to our website. So I do recommend doing like generation in that way, I’m sorry if I’m sort of monotone, I’m a little bit sick. Ezra: I would do both. Steve: So how would you separate out which to send to what, I mean you just run both and just let Facebook run with it? Ezra: You just set up two ad groups; and one ad group has the– I’m sorry ad set rather two ad sets; one ad set is using the retargeting targeting to send people back to your website, and the other ad set is using the retargeting targeting to build likes, they’ll both run to that same audience. Ezra: And they’ll both get allocation. Steve: Okay and then outside of Facebook have you tried anything else like Twitter, You Tube ads? Ezra: Yeah we run a lot of different ads, I think that for content marketing Facebook is really the game in town right now, Twitter is quite expensive, it doesn’t work great for ecommerce retailers; it works pretty well for business opportunity stuff and information where you have much higher profit margins, because Twitter clicks are between a dollar and three dollars depending on your market. You Tube at this point we do not have any– we’re tweaking around with it, and testing it, we obviously run retargeting for our videos and stuff like that, but we don’t have any kind of scale with regard to traffic on YouTube for our ecommerce businesses, we got a little bit, but I wouldn’t say it’s worth your time. Pinterest ads is looking very promising, but I would say that your best sources of traffic for an ecommerce business are going to be query based traffic on Google, so that Google Shopping, Google Search, or Amazon if you’re on there, then Facebook display, and then Google Display. Google Display Network is phenomenal, if you’re– at the very least you should be retargeting using the Google Display Network if that’s all that you’re doing. Steve: Let’s talk about that for a sec, because I have not being able to get the display network to work for me, it just hemorrhages money and fast. Ezra: What are you using it for? Ezra: And then you have to go in and look at what specific URLs on those websites are converting and get rid everything else. Ezra: So you’re probably going to lose money the first two months, but then you’ll find a couple of placements that work, and then those placements will really work. So it’s sort of a lost leader at the start where you’re trying to– when you’re figuring out which placements are going to work for you, but I would say at the very least throw a retargeting pixel up for Google on your website and run Google Retargeting, because that converts out quite well. Steve: Yeah that’s the only thing that we’re using right now on the GDA network retargeting. Ezra: The other thing is they have something called the Google Display Planner where you can go ahead and put in a keyword, and you can see the URLs that they’re going to suggest and then you can pick just those, and then you can run on those and then hopefully you got a better shot at getting some success right from the start. But the way we do it is the old school way we just put in some keywords and let it run. Ezra: Yeah you say you got a $2,000 budget to test, right? Then we just let that run over the course of a couple of weeks or whatever, set our daily budget, let it run, have a conversant check and pixel there, and then come in and prune out anything that didn’t work excluding anything that didn’t work. Ezra: Ah yeah you got– they’re a little sneaky that’s the other thing about Google, Facebook is not this way yet where Google is going to show you on mobile, they’re going to show you on like whether webs like 404 pages. Ezra: Yeah so you’re going to turn all that stuff off. Steve: Ezra I was hoping we could walk through also one of your email funnels, and how you kind of structure your emails. Is it primarily content emails, mixed in with sales? Ezra: Are we talking about pre purchase or post purchase? Ezra: So I would say the most effective pre purchase campaign goes like this, you opt someone in, right? And then over the course of a week you send them three pieces of presale content that lead back to your product, and that presale content could be social proof, it could be authority, or science, it could be an engagement article, or whatever it is, it’s a piece of content that then leads back over to your solution, right? Then the next week or next week to 10 days, if you’re me you’re doing a webinar following, because I believe that live event selling is the most effective way to sell any product on the internet, physical products, ecommerce products, information products. Like we really believe heavily in the use of live events to sell, and so you’re inviting someone, “Hey we’ve got this event happening where we’re going to tell you XYZ thing,” and it’s kind of just more presale content leading to your solution except that you’re doing it all live on a webinar, or you’re using a prerecorded webinar through something like Stealth Seminar. And you’re getting them excited about it, you’re inviting them to it, you’re getting them the opt-in for it, and then you’re actually running that event, and then you’re sending them out the replay, and you’re doing a whole webinar sequence. And then I’d run a half off sale for the next seven to 10 days, because if you haven’t converted them with your presale content and the webinar, then you’ll get a bunch of more people with the severe discount. Because our goal at that point is you’re in your in your two three weeks in, you just want to see if can acquire a customer, if you can acquire a customer, then you just pull them out of that out responder and you drop them into your weekly content bucket, where you’re just sending them blog posts. Ezra: Info product and ecommerce are the same thing man, you have a subscriber. I mean how does– you look at infomercials, right? The QBC, and the HSN, all that stuff, basically those are just many webinars for that product. They don’t go into all a bunch of story, but any product can have a story told about it, and then be pitched. I mean even if it’s a 20 minute webinar, a 15 minute webinar, even I mean obviously you’re probably going to prerecord it. So essentially what you’re doing is you’re creating a 10 or 15 minutes sales video, if you feel like you don’t have a lot of content that you can create for your product, and you’re sending people to that, but you’re framing it as a live experience. Steve: No I’m sure yeah. Ezra: I think that basically what we’ve been doing is taking all these funnels and all these models that we use in the information marketing world, and apply them to our ecommerce businesses and having great success with it. Steve: That is good food for thought, yeah maybe we’ll try some– I mean we’re wedding industry, it’s ripe with webinar potential. Ezra: Oh man, what are you guys selling? Steve: That is the title of our landing page actually, pretty close to it. Ezra: Oh man I guess I’m pretty predictable with what I suggest. Ezra: Yeah man I would have a webinar for sure, I would totally add a webinar, I’ll be talking about, “Man, you can personalize these handkerchiefs, you can–” I would go crazy with it. Steve: So let’s talk about the post sales funnel then, what do you do post sales? Ezra: Obviously you want to thank them for their order, and then I recommend having some pre-arrival sequences going where you’ve got a bunch of emails going out before the product arrives to get them excited about it, man you’re about to get this product, it’s going to be the craziest thing you’ve ever seen. Get them super juiced up, like get them really excited, there was a story of this hotel that immigrated pre-arrival marketing where they were like, they know when you’re going to show up, right? They know what day you’re going to get there, and so they send you these videos– I can’t remember who told me the story. And they’re you sending these videos, “Hey, this is Bob down in that restaurant. Man I’m going to cook you a shrimp skimpy when you get here.” And they got another one that goes, “Hey, I’m Joe” or “I’m Jane from the”– Jane probably doesn’t have that deeper voice. “Hi, I’m Jane. And I’m from the massage therapy lounge and I’m going to give you a massage.” And they basically tripled their sales and their amenities through this pre arrival sequences. Ezra: And so I use pre arrival sequences to get people excited and to frame the fact that we’re going to be asking them for a review, and to lower my returns and stuff like that. And it really works. So I have a couple of pre arrivals emails going on. Then I’d have a social promotion where I’m like, “Hey, here’s your chance to win a $50 Amazon gift card” or “here is your chance to win xyz thing. What we want you to do is take our product and grab your iPhone, and take a selfie” people love taking selfies, “of you with our product and upload it here or have it in Instagram and hashtag this.” So you get social proof, like people are using your product, so holding your product. They don’t have to be using it, just holding it up, and smiling. Then, we have a little banner on the bottom of our product detail pages with little feed of all the people who are using our products. And then we get a higher conversation rate on those product detail pages because we got social proof. So I put a social commercial in there. And then I would a survey go out page, can you tell us what you liked about our product or didn’t? And then I’d have couple of emails going out trying to sell them other stuff. Steve: So does that happen at end, where you try to sell them other stuff? And do you put on them on like this– like in your product is a consumable right? Ezra: We’ve got automation based on what product they bought. If they didn’t buy this product then we try to get on a webinar for another product. Like we’re doing some pretty sophisticated stuff, but I think that most important is that you get them excited first, then you try to get some social proof and you frame the review, then you get them take your survey, and then you start selling stuff. You don’t have to sell them right away, they’re– you can take some time. Steve: And let’s talk– you talk a lot about split testing on your blog. So what have been some of your biggest split testing triumphs when you’re optimizing your site? Ezra: We talking about for the blog or for the ecommerce store? Steve: For your ecommerce store. Ezra: Okay. For the ecommerce store, I would say have unique selling propositions in image format under the cart button. So that’s like the fast shipping and great customer service and whatever. Have images right under the cart button because you want to get people to click that. Have a video, a start video, on your product detail page just above the fold and easily visible. What else? I’ve got a whole course dude on my blog where we talk about conversion rate best practices for ecommerce store, it’s free. Steve: I will link up to it for sure. Ezra: I think I did like, I don’t know, an hour of stuff, of split tests on that, conversion rate optimization for ecommerce stores. And actually I’m going to release one on the Shopify blog pretty soon too. So it’s sort of an updated version of the one that’s on my blog. Ezra: It’s not quite ready yet, but in a month or two here on the Shopify blog we’ll have– kind of release all of our split tests for ecommerce which will be an updated version of the one that’s currently on my blog. Ezra: Well, if you look at– I wouldn’t even be looking at Facebook ads or anything, right? Because my first plan of attack would be to start an Amazon business. Ezra: And then market. Because I think that it’s just so easy to get sales over there man. It’s so easy dude. It’s like really incredibly– the opportunity is incredibly large right now on Amazon. And you need less money because you don’t have to build your own platform. It’s sort of just built for you. So all you have to worry about is marketing the product, but there’s no design and development or anything like that. Steve: That’s funny you say that. I have actually started restructuring my chorus myself to focus more on Amazon in the beginning. Ezra: Oh yeah, you have to man. Because if you’re on ecommerce, you’re a new ecommerce retailer, you need some time to start to understand keyword research and it gives you a way of making money while you’re just getting started and understanding how ecommerce actually works. Steve: So how do you bundle people over from Amazon over to your own site? Ezra: It’s quiet difficult actually. What you do is– the only real way to do it is to have package insert in your product that goes out from Amazon that sends them over to your site for some kind of sweet offer like another $1 coupon or something. But the way that we do it is we get a lot of our Amazon buyers from Facebook. And so we get a lot of leads that way. And all of the leads that we’re getting from Amazon, we don’t really have– there’s not great way to get them to become leads for your own website. Basically a lot of people once you start getting successful on Amazon, a lot of people start searching for you and that’s helpful, so you get leads that way, because your brand is well known. But at this moment there’s not a great way to take all the buyers from Amazon and get them over on your own platform. Steve: So do you actually run Facebook ads for your Amazon products? Ezra: Yeah, same way I just told you about, through pre article, through long form sales page that then leads over to Amazon. Steve: Interesting. What’s the incentive of doing that versus sending them to your own site? Ezra: The incentive of doing that is to grow the Amazon business, and also because Amazon converts like ten times as well as your own website. Ezra: So it’s an easier way to generate conversions. And most people are going to not be successful at driving contextual traffic to a presale page to a long form sales page for their product right out of the gates, while as with Amazon they could be pretty successful, because it’s quite easy to get someone to buy an Amazon product. Ezra: Conversion rates are like 30% higher. It’s ridiculous. Ezra: Yeah, but you can’t get a whole lot of volume from that. Ezra: It’s kind of tough. You have a business that’s making a 100 grand a month and you’ll only be able to spend like four grand on Amazon sponsored ads. So it’s a little bit difficult right now. Steve: And since we’re talking about Amazon. So what are some of your tactics for getting reviews? Ezra: Well, not really but I have a course for that. What we do is it’s a pretty straight forward sales funnel, where we are giving our product away at a steep discount. We’re selling our product at a really steep discount with the goal of getting a review. We say, “Hey, please try our product for $2. And here’s where you can opt in to get a coupon for that.” And then they opt in, they get their coupon, they buy the product at a discount and then we follow up with them through email and say, “Hey, we hope you loved our product, would you please gives us a product review, tell us what you thought of it.” And that’s essentially the funnel. It’s a little bit more complex than that. We use re-targeting, all kinds of stuff. But basically we’re selling our product at a discount in exchange for– to get it out there into the market place and get people to find out about it and to get their feedback on it. And then those reviews help us to rank organically in Amazon. And then we get organic sales from Amazon which is the life plan of our business. Steve: And how many reviews are you shooting for during this initial process? Ezra: I think in any new product you want to get up to a 100 reviews. If you can get up to 100 reviews, you’re probably going to get yourself up to ten to 12 sales a day pretty quickly. And I think once you’re up to ten to 12 sales a day on Amazon, then your product is starting to take off. We have a product now it’s doing like 100 sales a day, it’s got like four, 500 reviews. So I think that first 50 to 100 reviews is really important on an Amazon product. Ezra: Obviously they should be good. Five star reviews. Steve: Of course, of course. Dang Ezra we’ve been chatting all over the place. Ezra: Yeah, sorry. I’m a sort of– my voice is going out on me here, I got– I’m hoarse. Steve: Yeah, we’re good. We’ve been talking for 40 minutes. You held off for this long and so it’s pretty cool. So let’s end it right here. If people want to find you and then find all those tutorials that you mentioned, where can they find you? Ezra: Yeah, I’ve got those courses– thanks man, on smartmarkerter.com. It’s just like it sounds smartmarketer.com and there’s a blog post on there, instant courses and stuff like that. And also if you get on my email list over there, you can find out when I do stuff like events, and masterminds and things. Ezra: Once you click on the courses tab, on the main tab menu, there’s a button called courses and it’s got the conversion best practices course as well as the content marketing course. The Amazon course where I teach about Amazon products is a course that’s published by another company that doesn’t– it’s not available all the time. They do this launches for it. So it’s not available right now that Amazon course. But those other two courses the content marketing and the conversion courses is all there. Steve: Awesome, I’ll definitely send people that way. Ezra: Cool well thanks man. I appreciate it. This has been Ezra and Steve from My Wife Quit Her Job. Steve: All right take care. Hope you enjoyed that episode. The world of ecommerce is constantly changing and it’s important to understand how to leverage content based marketing to create a brand and a mind share for your business. And I love how Ezra broke everything down very clearly, and how he creates these funnels for his pro-age cosmetic company. For more information about this episode go to Mywifequitherjob.com/episode64 and if you enjoyed this episode, please go to iTunes and leave me a review. Because when you write me a review, it not only makes me feel proud but it helps keep this podcast up in the ranks so other people can use this information, find the show very easily and get awesome business advice from my guests. It’s also the best way to support the show. And please tell your friends because the greatest complement that you can give me is to provide a referral to someone else, either in person or to share it on the web. Now as an added incentive I’m always giving away free business consults to one lucky winner every single month, for more information about this contest go to Mywifequitherjob.com/contest. And if you are interested in starting your own online business be sure to sign up for my free six day mini course where I show you how my wife and I managed to make over a 100K in profit in our first year of business. Go to www.mywifequitherjob.com for more information and thanks for listening. This is incredibly helpful! So much advice and examples these days is from and for people marketing informational products. It can get a bit snake oil salesman-y. I’ve been fumbling around with marrying the message(s) of my business(es) with my products through marketing tactics while creating a cohesive message web-wide based upon an underlying strategy. Ezra has finally expressed this conundrum for me and joined some puzzle pieces in my head, which are immediately actionable. Thank you Steve and Ezra!